leucocratic variety of nepheline syenite from Sweden (särnaite). 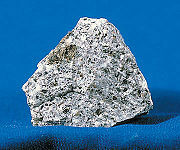 Syenite is an uncommon, coarse-grained, intrusive igneous rock. It has the same general composition as granite, but the quartz component is either absent or present in relatively small amounts (less than five percent). The predominant minerals in syenite belong to the feldspar group. The different varieties of syenite are named on the basis of additional minerals in the rock—for example, hornblende syenite and mica syenite. Syenites are occasionally used as building stones. The term syenite was originally applied to hornblende granite like that obtained from Syene in Egypt, from which the name is derived. Syenites are usually either peralkaline (in which the molecular proportion of aluminum is less than that of sodium oxide and potassium oxide combined) or peraluminous (in which the molecular proportion of aluminum oxide is greater than that of sodium oxide and potassium oxide combined). The feldspar component of syenite is predominantly alkaline in character (usually orthoclase). Plagioclase feldspars may be present in small quantities—less than ten percent. When present, ferromagnesian minerals are usually hornblende amphibole, rarely pyroxene or biotite. Biotite is rare, because in a syenite magma, most aluminum is used in producing feldspar. Syenites are formed during alkaline igneous activity, generally formed in thick continental crustal areas, or in Cordilleran subduction zones. A syenite is produced when a granitic or igneous rock undergoes a fairly low degree of partial melting—a condition that is required because potassium is an incompatible element and tends to enter a melt first. Higher degrees of partial melting will liberate more calcium and sodium, producing plagioclase, and hence a granite, adamellite or tonalite. Some of the more important occurrences of syenite are in New England, Arkansas, Montana, New York (syenite gneisses), Switzerland, Germany, and Norway. Episyenite (or epi-syenite) is a term used in petrology to describe the result of alteration of a SiO2-rich rock to a more SiO2-depleted rock. The term stems from "epi" and syenite. The process that results in SiO2 depletion can be termed episyenitization. This process is only referring to the macroscopic result of relative SiO2 depletion in a rock. The actual physical process leading to this SiO2 depletion may vary in a given metamorphic environment. Diffusion of chemical components in a stagnant fluid, related to differences in chemical potential or pressure, as well as advection of a SiO2- undersaturated fluid, may lead to the dissolution of quartz from the unaltered rock, thus depleting it of this component. This page was last modified on 2 April 2008, at 17:18.